This month’s project ended up being a real challenge. At the outset I just had too many ideas and it took far too long to rule any out. But here, at last, is my doll. Lesley will be familiar with me saying ‘separated at birth’ because so many times we have had the same thought or wanted the same set of stamps. Where craft is concerned we seem to anticipate each other’s next thought. We are like crafty twins. This time it is our girls. Do you spot a resemblance? After seeing Lesley’s Peacock Princess I started to t hink of my doll as The Lost Princess. Maybe the two were indeed twins but separated at birth. The common factor here is a very talented lady who designs stamps for Elusive Images and has created both of the face stamps Lesley and I have used. Glenda says this lady lives a private life away from the non stop party world we internet crafters sometimes seem to inhabit. So I’m not even going to mention her name. But she has a fantastic eye for images that make great rubber stamps and maybe if anyone reading this knows her you can let her know how much her artistry is appreciated. One of the things I love about Elusive Images stamps is the recurring motifs. So I think the faces of these two princesses are quite alike. I wanted a grungy style of doll with a spare kind of look to it. I also wanted to use some unusual materials. I’ve not quite achieved that. 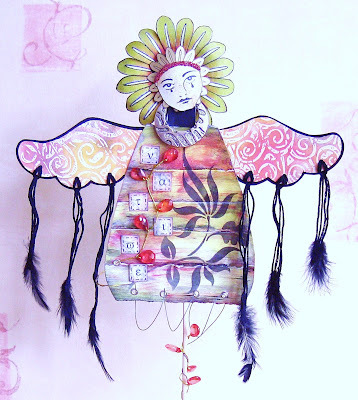 The doll’s body is made of paper strips just as Sue Roddis showed in the original Craft Stamper article. I’ve also used acrylic paints applied with a baby wipe as she did. At that stage the body reminded me of an African or South American native and at that point I introduced the neck decoration which is actually an acrylic ‘bead’ available here. I tried to find a script I could use to develop this theme but in the end resorted to printing the word ‘native’ in the ‘Symbol’ font on my computer. The main motif on the body is a Stewart Gill stencil, which has been inked through in black and the red crystals were from a supplier specialising in wedding crafts. The face I’ve used is a Pierrot stamp from Elusive Images. I’ve backed it with both large and small versions of a sunflower type flower from the EI Big Flowers plate. The face has been overstamped with A Stamp In The Hand’s Field of Sky. I removed the ink from the eye area and gave her a clear Stardust eyeliner which I think just about shows in the close up pic. The wings were originally chipboard shapes from The Artistic Stamper but I traced these onto glossy card when I decided to use a wax paper resist technique using the Divine Swirls Cuttlebug folder. I inked over the wax using DIs which complimented the paints I’d used on the body. They needed a little more visual weight before they looked right so I added threads and feathers as a nod to yet another kind of ‘native’. The reel came with the wire on and I hoped to incorporate it into the doll design, although I had already combined both gold and silver finishes. I’d planned to use a coffee stirrer like Sue’s and had been collecting them for a couple of weeks so I had practice ones too. But as I was assembling the doll I had a kebab stick on my craft mat and decided to try that out. It may be because it's Easter but I can't help feeling with the 'crown', the tears and the spread wings that this has a feel of the crucifixion about it too. Completely unintended but I can't shake the impression. I still want to use my other ideas and intend to make lots more dolls. The early stages of this project were very exciting and I was pleased with the way things came together at the end. But the week in between where nothing looked right was quite painful. Looking forward now to Judith’s choice for our next project. Jo it's gorgeous! I love the colour on the body! looks great! Jo, what a triumphant finish to our quartet of girlies. As I said earlier I was sure they would all have very distinctive personalities and yours has added something very different again into the mix. I love the range of techniques you have managed to incorporate. The colours and stencilling on the body is really gorgeous, the bead for her African inspired necklace works brilliantly. Most of all though I think I love the native American Indian touches, a culture held very dear in my family. Well done for doing something really different from the rest of us and thanks again for choosing this project. Jo, she might have caused you some anguish during her creation but she was worth it. She's absolutely beautiful. She makes me think of an Inca princess. The colours are gorgeous. I keep saying you have a wonderful eye for colour. Her headress is wonderful too and how clever to use the wax resist technique we learnt at Sheila's class. You'll have to refresh my memory as I've forgotten how we did it. 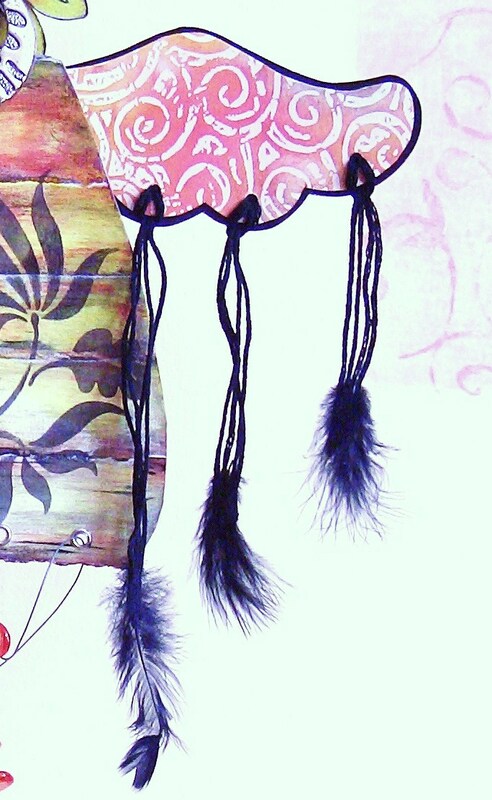 The threads and feathers are truly inspired together with the 'necklette' as they finish the doll off perfectly. I remember you finding the Stewart Gill stencil in the bargain alley at Graphicus and it was the ideal design for your doll. Brilliant, we now have a quartet of beautiful dolls as our mascots. Jo, She is quite lovely. Your doll has a very vulnerable and native feel about her. She almost seems an apparition and is so delicate. The stencilling is very effective. I personally think this project was a difficult one to do and you have done exceedingly well! Wow Jo - another stunner! You four have done so well with this challenge. Fantastic. Lovely doll and all the details are fantastic. wow...your one talented bunch of ladies...this is outstanding Jo. Lovely idea Jo - she feels really north american to me. especially with the dreamcatcher feel to the feathers. You've all done really well with the dolls, am very impressed! She's lovely Jo, she has a delicate,ethereal look to her, gorgeous. Love your art doll! I love the way everyone's dolls have come out so differently and each of you has your own distinct style. Beautiful. Jo - I love your beautiful wistful doll. She seems very pensive, and almost sad with the tears falling down her face. The detail on her is amazing. I'm catching up on all your posts here and I'm thrilled that I had something to do with bringing the four of you together and it's totally inspiring to see what you are encouraging each other to create. Love all of the dolls and indeed, all the creations I've seen here. I had to comment though to sing Sue Page's name out loud. She is the one of the main stamp designers for Elusive Images, though often it's me that does the faces. You're right, she doesn't seek the limelight at all, but she's a fantastic designer and a lovely person too.